A high specification, fully automated, modular system for use at EPD manufacturing or servicing facilities. Guaranteeing a high throughput and comprehensive calibrations. 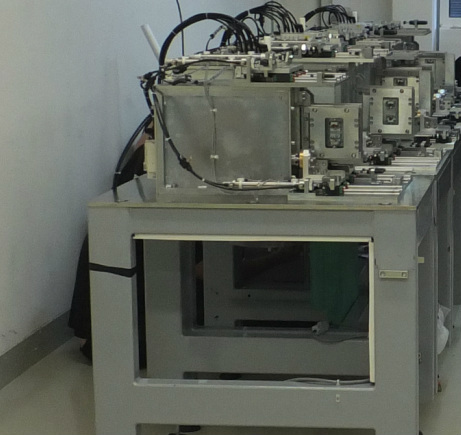 The system offers 24 hour unmonitored operation, high speed EPD handling, all at an incredible degree of accuracy. The function of the unit is to calibrate EPD’s placed into the source drawer using the radioactive sources installed in the heavily shielded source modules. The transport system can be driven in 4 axes (x, y, z and rotational). The pick-up head attached to the Z Actuator grabs the platen holding the EPD and pick/places it within the Calibrator. The sources located in the modules are fail-safe and will automatically drop and return to a safe position if the air/power is lost or one of the safety interlocks is activated. All cables connecting to the Transport system are housed in a plastic energy chain fastened to brackets and stainless steel troughs. Click here or here to see a video of the EPD Robotic Calibration System in action. The energy chain allows the cables to move freely without stress and to remain neat and tangle free when the trolley is moving in the transport system. The control unit is housed in a large steel cabinet located on the right hand side of the frame, which is powered by the mains isolation unit that is located next to the control unit in the frame. The control unit is connected to the operator's PC, which is positioned on the operator’s desk in the control room.